Data refresh is one of the features where any types of data visualize software should haveso you can keep data fresh and improve performance. It can be monthly to daily or every hours even minutes. Automation in data refresh will help us in the sense of keep our daily task be efficients. Let's see what Tableau data refresh can help us within different kind of Tableau products. Users like from sales department will always want to know how is their sales and stock movement around their retails shops by daily or weekly, your team member or manager can read at anytime and anywhere. Tableau Online and Tableau Server provide automating data refresh from monthly to per minutes. But you have to create an Tableau Data Extract (TDE) which in another words is create a copy of your data from database within Tableau. Then you can set the schedule of data refresh for your report or you can manually refresh the data if you not in the scedule time but want to see the result of your report based on latest data update. While for Tableau Desktop, user can manually refresh the data (either it is in database or in file form) whether the data is connected in live or extract. But bear in mind that if the data source is in file form (like Excel, Text, etc.) users have to set a fix file path for each data source so that Tableau able to find out the data file. 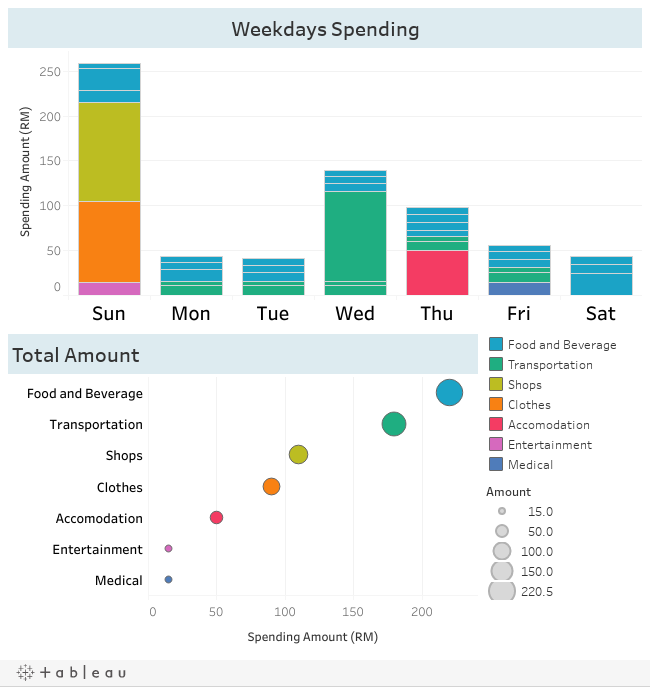 Like below dashboard, it is a weekly spending which is showing the a one week of spending details. As time goes by, there will be more data will entering into it. Then we can update the dashboard by manually updated the data source at Tableau Desktop (if you do not use Tableau Server or Online).